For Cinco de Mayo I wanted to highlight one of my favorite Mexican meals, Carne Seca, as a tribute to the Mexican culture and my roots in Tucson. But first, there is historical significance to the celebration: Cinco de Mayo, the fifth of May, commemorates the day in 1862 when the Mexicans triumphed over the French army – a powerful international military force at the time – in the southern Mexican capital city of Puebla, of the state of Puebla. The Mexican government could not pay their international debts and asked for a short reprieve from its debtors; all but the French government agreed. They were already occupying parts of Mexico and attacked the city of Puebla to gain more control. Outnumbered by over half the soldiers, the Mexican forces defeated the French (they recaptured it a year later and left about three years after that). It was a political and military battle that also affected the United States. Lincoln was president at the time and dealing with the American Civil War; France was backing the Confederates. We didn’t have the resources to fight another battle and wanted to stay somewhat neutral, even though it was critical to keep the French forces from overtaking Mexico and possibly the United States. Historian Donald W. Miles considers the Mexican victory a turning point for the U.S. because it diminished the French support of the confederates. The holiday is widely celebrated in the United States and in the Mexican city of Puebla; it is not a national Mexican holiday. Not only does Cinco de Mayo celebrate liberty and freedom, it honors the Mexican culture and heritage. The holiday is another celebration with food and traditions. Translated as dried beef, carne seca is a slow cooked meat that originated in Northern Mexico and is their version of beef jerky. I first tasted it at the renowned Tucson restaurant, El Charro Café. There are many variations of the recipe, some boil the meat and others call for a dehydrator. I cook mine for about 6 hours in a 250F degree oven. When cooked, the meat is shredded and then mixed with a sauce – it’s an all day affair (most of the work is done in the oven) and perfect for a weekend meal or party. As a reference for how to cook the meat, I first went to the cookbook “Purple Sage” from the Tucson Junior League. Over the years, I found London Broil to be the best cut of meat because it has great flavor and just enough fat to keep it moist and flavorful throughout the cooking process. I make it three or four times a year and look for the meat on sale in the “Manager’s Section” of the meat department and just keep in the freezer to use later. El Charro’s Carne Seca always had a great crispy texture so to get the same effect, I put the shredded meat under the broiler. The meat gets slightly crispy and then reconstituted in the sauce to absorb all the delicious flavors. To me, the sauce is as important as the meat because it adds that layer of flavor that I’m always talking about. It consists of Poblano peppers, jalapenos, onions, garlic and tomatoes. I found canned tomatoes work best for me because they add flavorful liquid and body to the sauce. My favorite is canned fire-roasted crushed tomatoes. I’ve tried just using fresh tomatoes but it was missing the flavor that the fire-roasted tomatoes have. 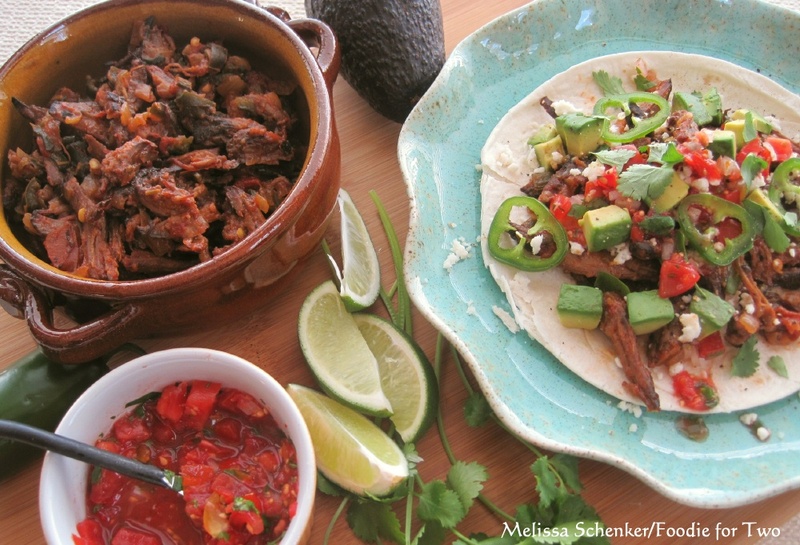 There are so many ways you can enjoy carne seca – in tacos, burritos, tostadas, enchiladas or on cheese crisps. In the top photo I used flour tortillas for tacos and garnished them with jalapenos, avocado, cilantro, limes and a quick salsa fresca (fresh tomatoes, onions, cilantro, jalapeno, lime juice, lime zest, olive oil and salt and pepper). Carne Seca can be frozen for up to a month if you have any leftovers. It takes a while to make but is worth the effort. Eat well and share the love! Peace to all. Cook the Meat: Heat oven to 250F degrees and position a rack in the middle of the oven. Place a baking sheet rack in a sheet pan. Add a light drizzle of oil to both sides of meat and season well with salt and pepper. Place meat on baking rack and put sheet pan on middle rack of oven. Bake the beef in the oven for 6 hours, turning every 1 ½ hours, until the meat is dry and can be easily pulled apart with a fork. Beef should dry out completely and slowly. After 2 hours of cooking, add 3 cups of water to bottom of pan to create a sauce. When the pan is deglazed about 30 to 45 minutes later (if needed, scrape the bottom with a rubber spatula to get cooked bits), pour off liquid into a measuring cup and return sheet pan to oven. Another hour later, add 3 more cups of water to pan and let cook for an hour and pour off juices. When meat is done, remove from oven and let cool for about 10 minutes. 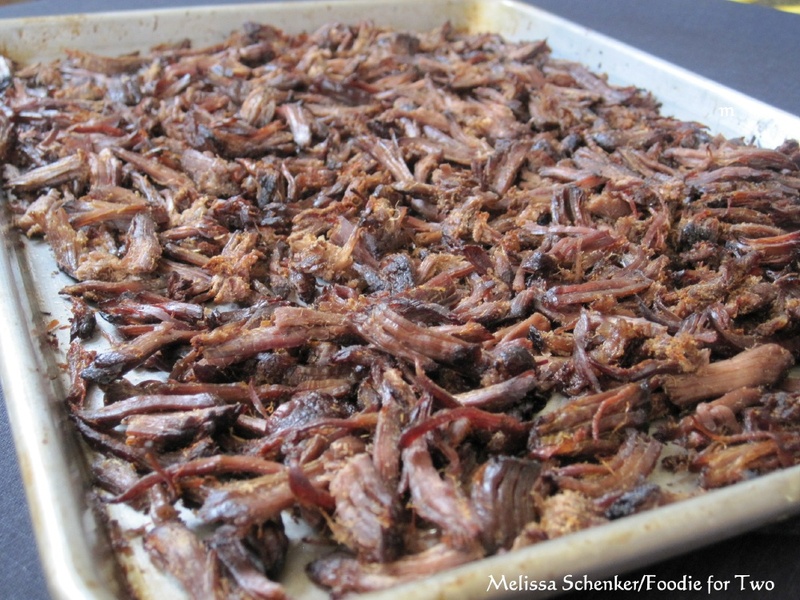 Shred meat by hand or with two forks. Return to sheet pan (without the rack) and broil on high for of 5 to 8 minutes. Set timer for 2 minute increments, stir meat and repeat process two to three more times or until the meat pieces are slightly crispy. Make the Sauce: While the meat is cooking, get all the vegetables prepped and store on cutting board or in bowls, covered with damp paper towels. Start sautéing the peppers when halfway done shredding the meat. Heat a large skillet over medium heat with 3 tablespoons olive oil. When hot, add the diced Poblano peppers, diced jalapeno, ¼ teaspoon salt and 1/8 teaspoon pepper. Stir well and sauté for about 10 minutes until peppers just start to soften. Reduce heat to medium-low and add the onions along with 1 tablespoon olive oil and a good pinch of salt and pepper. Continue to sauté, stirring often until vegetables are tender, 15 to 20 minutes. Stir in garlic and cook for about 30 seconds. Add tomatoes, a pinch of salt and pepper, all the meat juices and stir well. Increase heat to medium and bring to a boil, reduce heat to low and let simmer while finishing the meat. When the meat is done broiling, add directly into the sauce. Stir well and let cook over medium heat for 15 minutes to allow meat to absorb the sauce. Serve hot. Freeze any leftovers for up to one month. 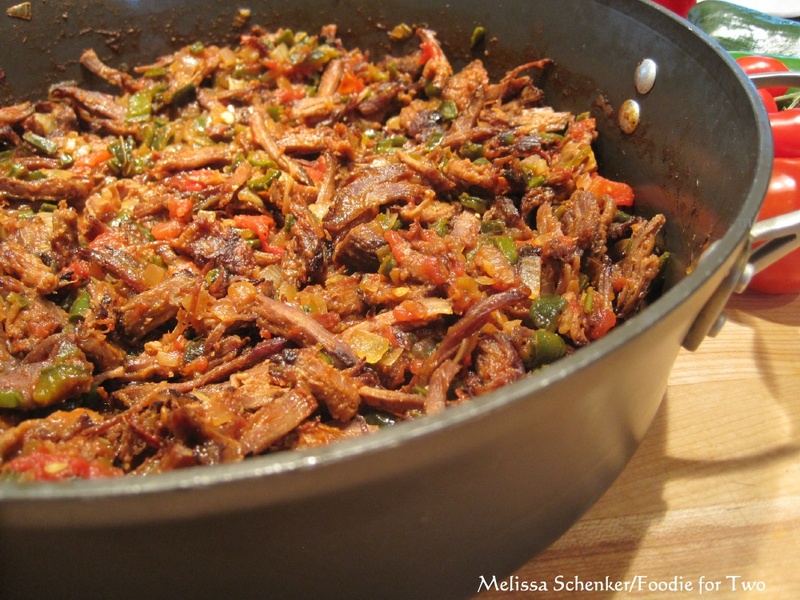 · Serve Carne Seca in tacos (flour or corn), tostadas, burritos, enchiladas or a topping for cheese crisps. · Garnish with salsa fresca, avocado, jalapeno and fresh cilantro. This entry was posted in Dinner and tagged Carne Seca, Cinco de Mayo, Cooking, London Broil, Poblano, Recipe, Shredded Meat. Bookmark the permalink. gracias for the history you wrote, I did forget that celebration, but I know it is a big celebration in puebla, and I will try carne seca recipe (never tried before). De Nada! Cinco feliz de mayonesa! I had fun doing the research and learned something new. Let me know how you like the recipe, por favor. Coincidental to your post, Sunday, James & I had lunch at El Charro – the food was so good we decided to come back on Thursday to celebrate Cinco de Mayo – of course it doesn’t hurt that they’ll be having $2.00 Coronas :*) You can bet I’ll be having the Carne Seca! Cinco feliz de Mayonesa! Thanks for stopping by my chocolate matzo post! This recipe looks wonderful – just something my family would really enjoy. Maybe I will have more energy later in the week and try this for Cinco de Mayo. Thanks for sharing so much history and a great recipe. It looks incredible and I’m sure it tastes wonderful. It’s great for one person and it can be frozen for another meal! Liked your history lesson. This is first rate. I love the history, pictures and descriptions. I can’t wait to give it a go!